1 – Choose “Preferences…” from the Edit menu (or key combo Ctrl+comma). 2 – In the Preferences dialog select the “External Editing” tab pane. 3 – In the “Additional External Editor” section click the “Choose” button to the right of the Application text and select “Iridient X-Transformer.exe”. The program will typically be located in the folder at “C:\Program Files\Iridient Digital\Iridient X-Transformer”. 4 – In the File Format popup menu select “TIFF”. 5 – The Color Space popup menu option does not matter. No need to worrry about sRGB not covering the full RAW color range as the color space choice here will have no impact on the converted DNG image produced by X-Transformer. Lightroom internally is based on a color space similar to “ProPhoto RGB” so perhaps that option may require a bit less processing time on export, but I have not investigated whether this has any notable impact at all. My guess is you won’t notice a notable difference in speed regardless of option selected here. 6 – In the Bit Depth popup menu select “8 bits/component”. No need to worry about the actual bit depth here as the intermediate file will simply be overwritten. Choose 8 bits to speed file save time. 7 – The Resolution setting does not matter at all. Simply leave as is. 8 – In the Compression popup menu choose “None”. Again the actual option here has no impact beyond the intermediate file save time and no compression should be fastest here. 9 – From the Preset popup menu (back at the top of the section) choose “Save Current Settings as New Preset…” and give it a sensible name like “X-Transformer”. 10 – Click the “OK” button to save and close the Preferences dialog. 1 – Select the image you want to convert in the thumbnail browser or Library module of Lightroom. 2 – Click the “Edit” button to send the image to Iridient X-Transformer for conversion. 3 – A dialog titled “Edit Photo with Iridient X-Transformer.exe” will appear. With RAW images the only option enabled in this dialog is “Edit a Copy with Lightroom Adjustments”. 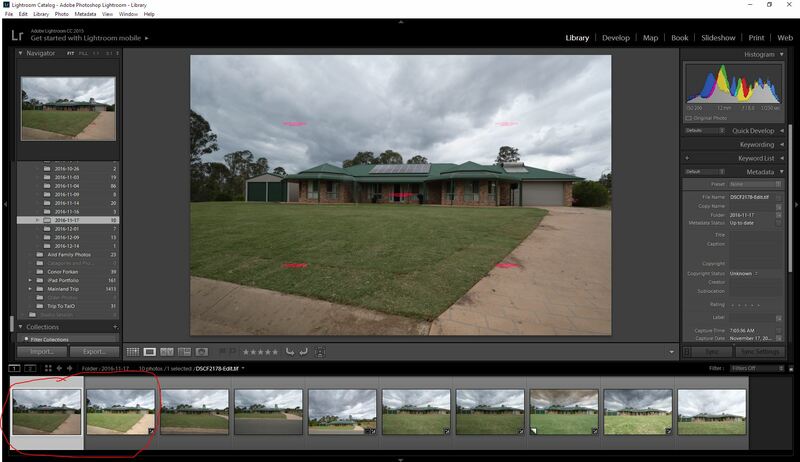 No need to worry about the Lightroom adjustments being applied here, as the intermediate image will simply be overwritten by Iridient X-Transformer. 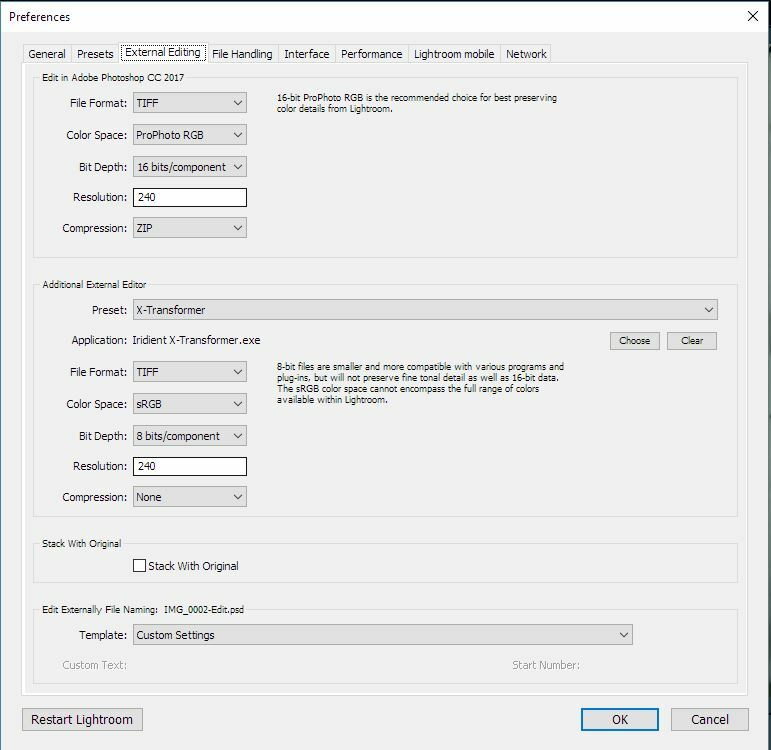 Yes, it would be super if Lightroom allowed you to send a reference to the RAW directly without wasting time doing its own RAW processing, but so far Adobe does not allow this in Lightroom. 4 – Choose “Edit In -> X-Transformer” from the Photo menu or the image contextual menu (shown by secondary clicking image). 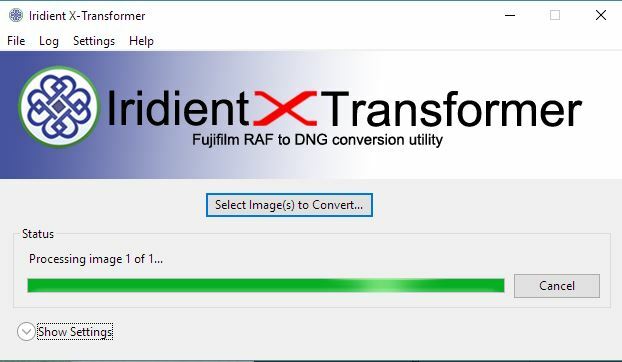 6 – Click the “Yes” button in the Iridient X-Transformer dialog to convert the image to DNG. Once the conversion completes in Iridient X-Transformer, the image will immediately update in Lightroom to reflect the newly processed image. Despite the image file extension in Lightroom being “tif” the image format will now indeed be DNG. 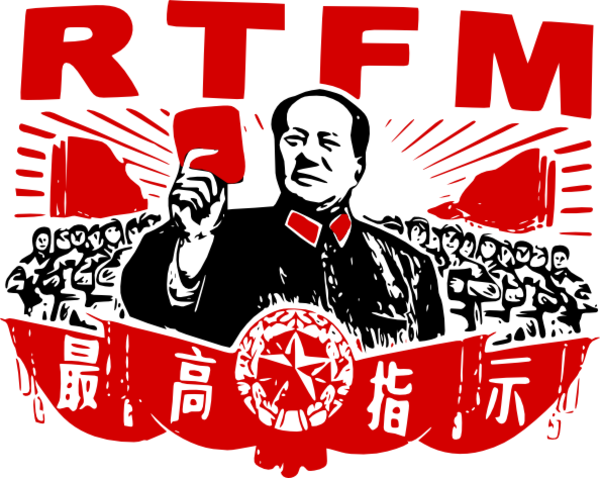 The DNG image format is based upon the existing TIFF file format and DNG files share much of their core formatting and metadata with TIFF. 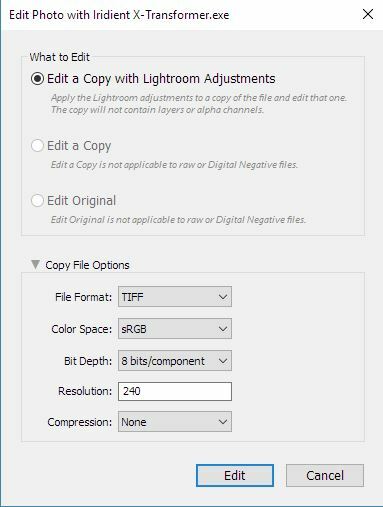 Lightroom appears to handle DNG format files having a “tif” extension just fine and there is no option with External Editing to use DNG or other RAW formats. So there you have it. An actual help file that actually helps. Finally I got IXT to work the way I want it to and it’s great! From what I’ve read this is windows only for a while. Maybe later in the year for the Mac version? I’m sorry to hear that. Hopefully it’s a bug that will be ironed out when it gets out of BETA. So far all reports of crashes or instability with the program have been with people that have AMD processors. The software requires Intel supplemental SSE3 (sometimes referred to as SSSE3 or SSE3+) and it appears some, perhaps all, of the AMD processors entirely lack or do not properly support these instructions. It’s not totally clear from their web site as they claim support for SSE3 and other later versions of SSE, but they do not specifically note SSSE3. It would be helpful to have more details on your system, PC make and model, processor and GPU types and speed if you know, amount of memory and monitor size (HiDPI or not). The AMD Phenom II line for sure does not work. I’m guessing the earlier Phenom processors probably are incompatible as well. So far all users who’ve had crashes and who’ve reported back detailed system specs have had the Phenom II processor. For now best compatibility is likely going to be with genuine Intel processors (Core II Duo generation or later though I have had a report of someone using it on a Core II Solo). I will investigate this issue with the AMD processors further and depending on the work involved and the amount of user interest may consider trying to add support for some of the AMD processors in the future. This is because you have the 125% font display setting set in Windows (because you have a largish monitor). There are a few threads in the Fuji board of dpreview.com discussing this issue with some workarounds. Brian is aware of it and hopefully this will be resolved in the next beta version. so this is weird. I did everything as you said, and the image i got back in lightroom (after processing it in irident) was a completely different image. The file name was the same (with “edit” added and in tif form), but showed a completely different image from my catalogue. Any idea why this could be happening? This doesn’t work for me either. I did as you say but when it gets to finding an associated RAF file, it says ‘An associated RAF file was not found’. I am using Iridient X as a Lightroom plugin. When I right click on file to edit in Iridient. It starts to prepare file for editing, then I get a message saying Iridient cannot fine the associated RAF file. Ca you help fix this please? Iridient was working fine at first and I was happy with it, now this problem ?.